Refresh your wall paint with a fresh coat or two. Our exterior and interior paint professionals at Santiago & Son Professional Home Painters serve Massachusetts, homeowners by helping them perfect their home. Whether you want to paint one room, a door, or your whole house, or want to stain your deck, we can help. Prepare your home for warmer months by freshening it up with a color that's not only inviting, but is sure to add value to your property. Once we complete our paint job, you'll never want to leave your home. Now you can enjoy every room surrounded by the perfect color of your choice. 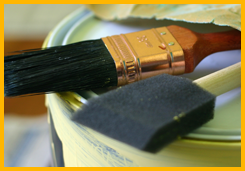 Learn more about our painting services. Our exterior painting service is a great way to refresh your home. Each exterior paint service comes with a free power wash.
We warranty our work for three years. If you find a chip or need to repair an area, one of our team members will come to you right away.